The Running Therapist. : On your mark, get set, GO 2011!! On your mark, get set, GO 2011!! 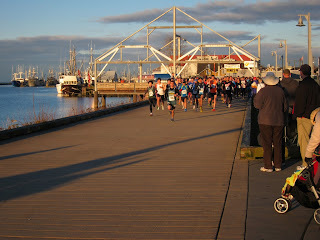 It was a crisp and clear morning on January 30th 2011 and it was looking like perfect running conditions for a flat and fast Steveston Icebreaker 8k put on by Kajaks. 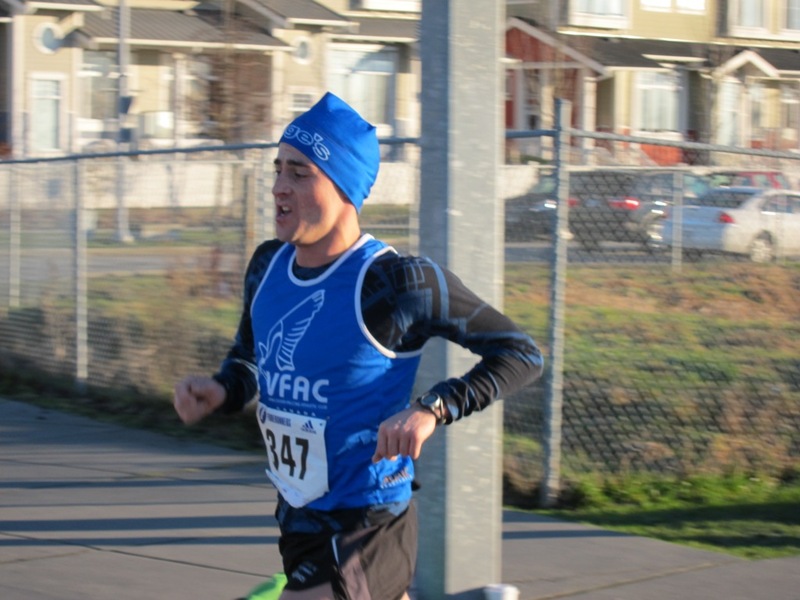 I was excited for this one as I had set an unofficial personal record at our club race the week before and was sure I would be able to top that among such a speedy field. There are always some big guns out at the provincial Timex races and great times follow if you can hang with the big dogs without blowing up. It was great to see everyone again. I love saying hello to all the different runners before and after the race, it makes it feel like a big running party. It did seem like everyone was ready to battle this morning as I prepared for the race and readied myself for my warm up. I laced up my Asics Pirranna's (the lightest racing flats in the world, first time racing them) and stripped down to my Monavie shorts and 200 Oasis Crewe from Icebreaker. I noticed Steve Osiduik approaching the start line and congratulated him on his talent then introduced my self. Jerry Ziak was also up front today as well as David Jackson. Not to mention the swarm of blue VFAC jerseys surrounding me. I could feel the the excitement building. The sun felt amazing on my face as the gun went off and I ran towards its warm embrace. The first hundred meters were quick as I expected while everyone filed into position. There was a young speedster who took the whole shot and was quickly swallowed up by the lead pack. I was surprised to see how close I was staying to what seemed to be an enormous lead pack. At least 10 of us were together for the first 2km. I was right on the heels of Osiduik and Drew was hot on mine. Shortly thereafter, I could see the lead few pulling away and I knew I would have to let up a bit to avoid spending too much too early. As we approached the 3k mark Drew took the lead over me. I settled into his draft and we pushed on into a slight headwind alongside the water. I could see the runners ahead pulling away slightly and felt as though I had what it took to keep my rope taunt on them. I pushed past Nicholson and focused on Geoff Reid from the Harriers. As I approached the half way point, I could see the leaders turning back now for the final 4000 meters. It was a battle between Ziak and Jackson and sure to be a good one. Can't wait until I'm fast enough to battle with them! I took a deep breath and relaxed as I rounded the turning point then surged out of the corner with a blast of power. The wind was now at my back as was the sun. I had flat asphalt and a mild tail wind to guide me home, it was time to boogie! I kicked it into the next gear and clawed at the foot prints still hot from Reid. Deep breaths and long powerful strides as I focused in on form and technique all the while concentrating on closing the gap. I was closing in on my target, getting ever closer to the finish and running out of steam. It was the 6th km and I was feeling the burn. I was doing everything I could to stay strong. Very tough km but once completed I knew the finish was only one last push away. I had lost sight of Osiduik through the 5.5 and 6th km because there were several corners and turns in the route. As I rounded the final corner I could see Reid, and Osiduik was just finishing. I was unable to catch Reid and his push to the finish was very strong, but I managed to keep the gap between him and I the same. We all collapsed over ourselves at the finish as we gasped for air. Hand shakes all around for the top ten. Water and congrats to Nicholson who followed me in and kept me on my toes. Shortly after it was time for the warm down jog. It was a great race. Unfortunately I didn't set the PB I was hoping to and ended up 8th overall and 3rd in my age group with a time of 26:09. At least it's a certified personal best result. There were some delicious and healthy bars called Maki Bars at the awards ceremony. My friend and extremely talented runner Tristin Simpson had recommended them to me so I had to try them. To my delight they were fantastic. The woman who makes them, Maki gave me a bag of them to take home. I was certainly happy about it because I went straight to work and they kept me from passing out from hunger. You think I would learn how to nourish myself after so many post race work experiences. All in all a fantastic day at the races!